The E-coustic Systems MP-4 (four channel) and MP-8 (eight channel) Microphone Preamplifiers provide unrivaled sonic quality and unsurpassed ambience retrieval that are fundamental elements of transparent electronic acoustic enhancement. The MP-4 / MP8 are unique in their ability to maintain uncolored timbral accuracy at all dynamic levels. Furthermore they achieve this over an exceptionally wide frequency response - from 3-Hz to beyond 300kHz. The entire audio path is balanced using precision components that reduce THD to 5 parts per million (0.0005%). The FET based output stage provides a massive 32dB of headroom, while the input stage accepts up to +23dBu without using attenuators. All switches use gold contacts, allowing these units to perform flawlessly over time in machine rooms where temperature and humidity vary as mechanical systems are cycled. 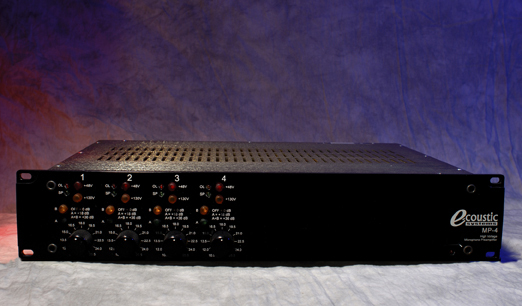 Both units are available with optional 3 outputs per channel, as well as optional AES/EBU digital outputs.